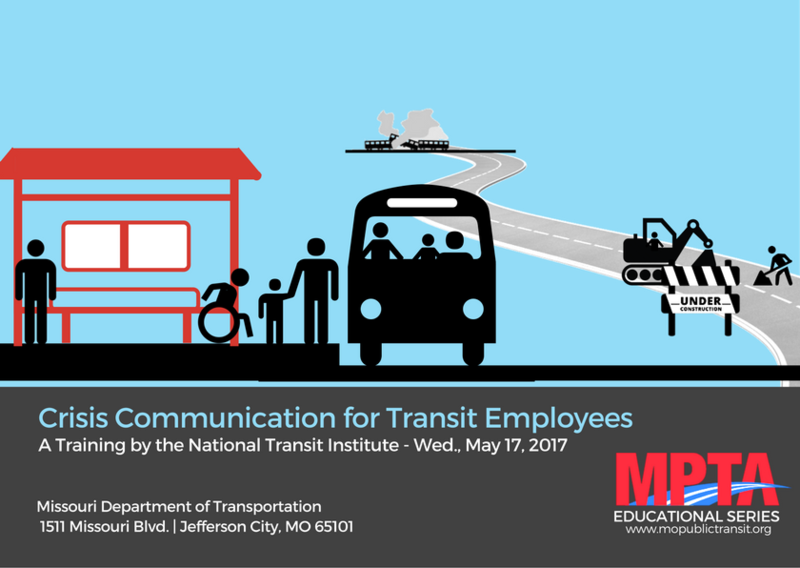 Join us on Wednesday, May 17, 2017 for the next installment of the MPTA Educational Series: Crisis Communication for Transit Employees, a training by the National Transit Institute (NTI). Effective communication is essential to the management of any transit crisis—whether it is a catastrophic event such as derailment or terrorist attack, or a more mundane one such as a power outage or prolonged service delay. National Transit Institute’s (NTI) Crisis Communication Training for Transit Employees will equip frontline and supervisory transit personnel with the skills and techniques they need to communicate effectively within their organizations and with passengers throughout a crisis to enable successful response and recovery. The training will be held from 9 a.m. to 12:30 p.m. on Wednesday, May 17, 2017, at the MoDOT facilities at 1511 Missouri Blvd. in Jefferson City, MO. Chris Boyler from NTI will lead the training.